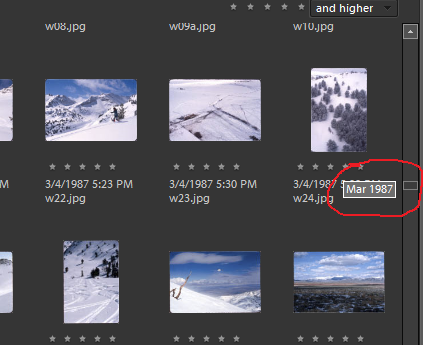 This lets you scroll to a given date very quickly, without waiting for LR to fully display the thumbnails and their annotations (which is never fast enough). LR could extend this to all of the sort orders: capture time, rating, pick, file name, etc. It would show in the tooltip the appropriate value (date, rating, file name, etc.) of the first visible thumbnail. For a user order, LR could show the number within the collection of the first image.